Published by: Devir, Gigamic, Swan Panasia Co., Ltd.
"It's positively spiderific to have a sister!" That is something the two spider brothers Parker and Peter can agree on any day. 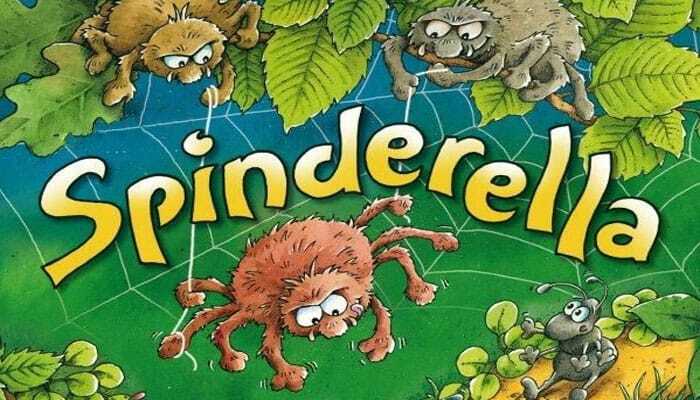 After all, their sister Spinderella is still light enough that the two can rope her down using a single thread of spider silk. Spinderella herself loves this, too. It is her favorite thing in the world to look down on the forest's main ant road and to give the little guys below the occasional fright. "Gotcha! He he! "- and she has caught another ant, only to return it to where it came from. What Spinderella and her brothers do not know though is that today is the day of the great international ant marathon. 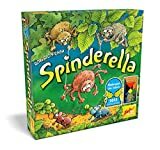 In Spinderella, players race to get their three ants across the forest floor as quickly as they can, but spiders await in the branches above and - with a little help from opponents - one might swoop down to scoop up your ant and return it to the starting line. You can do the same to them, of course, so search for the right time to act and the right places to hide. Get your ants safely to the finish. 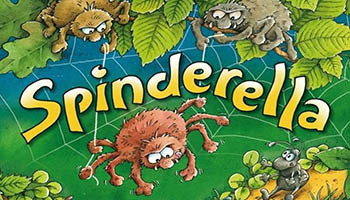 Use the spiders to interrupt the "cutie-crawlies" of the other players. 1) Place the ant racetrack on top of the empty inlay inside the bottom half of the box. Choose whether you would like to use the shorter or the longer ant racetrack.